Tattoos have increased tremendously in popularity – a phenomenon that can be seen across the world. In France alone, the number of tattooists has increased ten-fold within a decade. Twenty per cent of people between the ages of 25 and 34 have one. And in Germany according to estimates, approximately 10% of the population has tattoos – that is more than eight million Germans. Currently, about 75 million people in Europe have a tattoo. Over time, various methods have been established for removing tattoos. In contrast to those processes, laser technology has established itself as a gentle, low-pain method of treatment achieving optimal results. 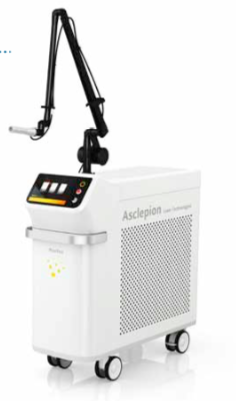 For years, Asclepion has successfully used lasers from the TattooStar family to remove tattoos – with thousands of satisfied patients to attest to this. The new PicoStar Nd:YAG dual wavelength (1064/532nm) usesthe most modern technology for the removal of tattoos, pigmented lesions and permanent makeup. The two wavelengths give physicians the flexibility to adapt treatments precisely to the patient’s needs and to a wide range of pigment colors (from darker colors to blue and red). Fig. 1: The new PicoStar in modern design. The PicoStar uses the latest technology with the highest power (2.5 GW) to generate pulses below 300 ps for the most effective treatment of pigments and multicolored tattoos. The system can operate for a long duration with high speed and without the need of pre-pulses for the user. This makes it one of the fastest and most reliable PICO systems on the market. The ultra-short pulses allow bursting the pigment particles without any thermal side effects or scars. This increases patient comfort and providing greater flexibility and efficiency. The PicoStar has ergonomic, thin and light zoom handpieces (ppot sizes: 2-6 mm (ST), 6-10 mm (XL) and 2.5 x 2.5 mm (DYE). It is made of stainless steel for easy handling and cleaning. Thanks to a rotating ring on the handpiece, the spot size can be adjusted without changing the handpiece or tip. This offers you the flexibility to work on both larger and smaller areas with the maximum degree of precision. A special lens system creates a uniform spot without “hot spots” by distributing the laser energy in a perfectly way. This results in less pain and lower bleeding levels. The shape of the spot is designed to guarantee the optimum coverage of the treatment area with greater efficiency. The zoom handpiece with automatic spot detection allows flexible and easy adjustment for all applications and body regions. This ensures fast, safe and efficient treatment with a convincing result. The PicoStar features a large, clear, sharp and easy to use 10.1” LCD with touchscreen. It has been completely redesigned and adapted to the needs of the user. The menu is suitable for both beginners and experts. The large buttons and icons offer good detectability and the dark background delivers a higher contrast and color brilliance. There is a clear highlighting of active elements through size and color change. Beginners can choose the indication, and have the corresponding parameters set automatically. Professional users can go directly into the work screen with all parameter settings, for a fast and effective treatment. Asclepion Laser Technologies aims to communicate to the users the advantages of laser technology „Made in Germany“ and to increase the wellbeing of their patients. Hereby Asclepion supports, optimizes and gives assistance in daily medical practice through it’s diverse range of technological innovative products, continuous training and client specific support.